The Fondation Louis Vuitton’s blockbuster smashes into the top spot, beating the Centro Cultural Banco do Brasil, which topped this category in our last survey. The Brazilian venue is the only free show—a contrast to 2016, when six of the top ten were free. The next best-attended charging show was Van Gogh in Melbourne—a familiar artist in this category, but at a venue that is more unlikely. It is striking that pre-war and European Modern art still edges post-war American developments in terms of public appeal: the Shchukin collection, with its Matisses, Gauguins, etc, and Mondrian, Van Gogh, Magritte, Picasso, Cézanne and Picabia all feature in the top ten. Rauschenberg is the only US artist in the list, while two of the showings of a touring Abstract Expressionism exhibition, at the Guggenheim Bilbao and the Royal Academy in London, were just outside the top ten. The Tokyo National Museum is a regular in this category. There were 11,268 visitors a day to the blockbuster presentation of two-dozen sculptures by the celebrated Japanese artist Unkei (around 1150-1223). As the premiere sculptor of Buddhist figures in the early Kamakura period, he received commissions from some of the most prestigious temples and aristocratic families of the period. It is both the top exhibition in this category, as well as the most-visited show in our overall survey. Another exhibition on the Kamakura, at the Nara National Museum, pulled in 2,484 visitors a day over a three-month period. A newcomer to the list, however, is the institution behind the second most-visited show: the Metropolitan Museum of Art. One of the last exhibitions staged under the leadership of the New York institution’s former director, Thomas Campbell, the major loan of ancient Chinese art from the Qin and Han dynasties included more than 160 works from 32 institutions in China and was seen by 3,415 visitors a day. The Japanese have an insatiable interest in European art from the 15th to the beginning of the 19th centuries, so it comes as no surprise that the three most heavily attended exhibitions in this category should have taken place in Tokyo, with Bruegel’s The Tower of Babel taking top spot. The exhibition in the Japanese capital showed an enlarged reproduction of the titular painting so that visitors could get a closer look at the hundreds of tiny figures depicted in the work. Of course, no matter where in the world, certain artists’ names are guaranteed to pull in the crowds: Vermeer and Caravaggio both did the trick for the Louvre last year. There are, at the same time, some surprises. Apart from experts or locals, who had heard of Giovanni dal Ponte or Cristóbal de Villalpando? Perhaps they are part of a new trend, following the unforeseen popularity in 2016 of the little-known Francesco Botticini. One of the joys of the thematic category, which includes exhibitions linked by theme rather than by time period or genre, is that you never know what to expect. In 2017, four exhibitions in our top ten focus on portraits or the human form, from the selfie—an example of 21st-century narcissism at its best—to two decades of photographs of the US President John F. Kennedy and his family. The Saatchi Gallery comes in third with its selfie celebration, which drew 4,693 visitors a day, while 3,732 people a day went to the Smithsonian American Art Museum to see portraits of the people’s president, helping to place the show in fifth position. But the top show was one on the art of the Japanese tea ceremony at the Tokyo National Museum, which had 5,198 visitors a day. A travelling show from the British Museum, A History of the World in 100 Objects, had a respectable showing in Shanghai with 3,627 visitors a day. The David Hockney retrospective at Tate Britain gave the museum a much-needed boost after years of dwindling attendance, pushing total visitor numbers to the museum to a record 1.8 million in 2017. While the blockbuster show had 4,346 visitors a day in London, it did even better when it travelled to the Centre Pompidou in Paris, where it was seen by 5,788 visitors a day. However, this was not enough to take the top spot in the French capital, where the Modern masterpieces from the Shchukin Collection—by Picasso, Matisse and Gauguin, among others—were seen by a staggering 8,926 visitors a day. The exhibition at the Fondation Louis Vuitton came second in our overall exhibitions list. In New York, the Robert Rauschenberg survey at the Museum of Modern Art came out on top, with 5,500 visitors a day. The exhibition, subtitled Among Friends, was a slightly bigger version of the survey at Tate Modern last year, which, with 1,456 visitors a day, missed out on the London top ten. The Saatchi Gallery’s exhibitions are a consistent presence in this list, proving that poor reviews and general art-world apathy are no barrier to the creation of significant footfall in Chelsea. The 7,509 visitors a day for Painters’ Painters beggars belief. Unlike Saatchi’s free shows, those that charge fees give an accurate indication of the popularity of particular artists, and it is no surprise to see Bill Viola and Yayoi Kusama, two ubiquitous figures internationally, attracting huge numbers. Pierre Huyghe, much acclaimed by critics, has benefited from surely his largest-ever public audience at the Guggenheim in Bilbao. 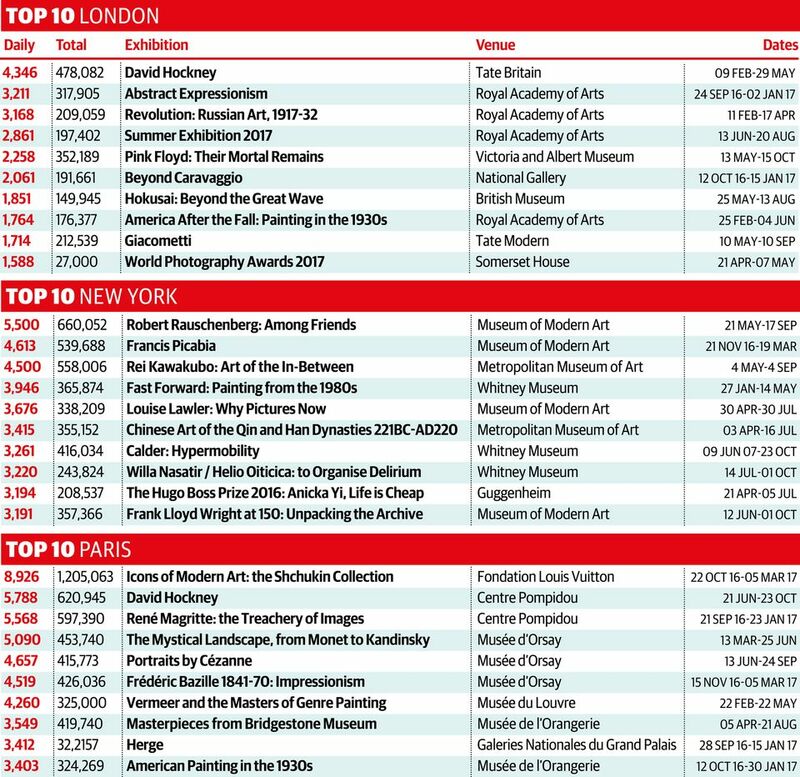 But the title of most popular artist of the year must go to David Hockney: his show at Tate Britain prompted around 478,000 people to part with their money, just for him, and then a further 621,000 saw the exhibition at the Centre Pompidou as part of a general-entry ticket. It means that across the two cities, around 1.1 million people saw the retrospective. The most popular antiquities shows usually have a wide geographical spread, both in terms of host institutions and cultures being explored, and this year is no exception. The Kunsthistorisches Museum in Vienna struck gold with its choice selection of artefacts found at the ancient Bulgarian site of Ada Tepe, Europe’s oldest gold mine. With 2,241 visitors a day, it was the most popular antiquities show of 2017. The ancient civilisations of the Americas feature twice in the top ten, with a show on the Mayans at the Palazzo della Gran Guardia (around 1,373 visitors a day) taking third place and a display of Mesoamerican pottery in Mexico City coming in seventh. Animal mummies, including jackals and crocodiles, as well as a recreation of an animal catacomb, pulled in the crowds in Liverpool (1,053 visitors a day), and a travelling exhibition of objects from the British Museum that looks at competition in Ancient Greek, held in Madrid, rounds out the top ten. The Czech Alphonse Mucha tops the list that is otherwise dominated by French artists. Instead of his well-known Belle Epoque posters, however, the exhibition in Tokyo focused on the artist’s Slav Epic, a group of 20 canvases, some more than eight-metres tall. The entire cycle had never left the Czech Republic before, and due to the fragility of the works, conservators, as well as the artist’s heirs, tried to stop their export. Nonetheless, the Czech government, which owns the works, chose to send them abroad for a two-year tour of Asia. Mucha’s reputation was revived in the 1960s, a period in which Art Nouveau became popular—a movement that was indebted to Japonisme, something that may account for his show’s popularity in Tokyo. It was in the 19th century that Paris came to be the world centre of art and French painting became synonymous with all that was progressive in art. Even so, the 2017 results here replicate what was once the norm for the top ten: the supremacy of the Impressionists and their offspring. The hegemony of the French Impressionists may also indicate the divide between, on the one hand, academic, multiculturally minded and relativist art historians who insist on canon-busting, and on the other the general public, which can never get enough of the colourful, easy to look at, mentally unchallenging French paintings. Where either fashion or jewellery have previously dominated the decorative arts category, this year is a mixed bag. Jostling in the top ten are shows on tapestries, jewellery and carvings. But fashion takes the top two spots, with a show on the Japanese designer Rei Kawakubo, founder of the Comme des Garçons label, at the Metropolitan Museum of Art, followed by the NGV International’s blockbuster celebrating Dior’s 70th anniversary. An exhibition of Art Deco fashion and jewellery at the Kyoto Costume Institute (KCI) narrowly missed out on a place in the top ten, but the travelling exhibition placed third for its showing at Moscow’s Kremlin Museums. And wedding bells also brought in the crowds with two of the top shows based on the happy nuptials—one displaying the wedding dresses of the Italian designer Regina Schrecker at Mantua’s Palazzo Ducale, and another at Hong Kong’s Heritage Museum exploring elaborate wedding rituals during the Qing dynasty. But is a love for the decorative arts waning? The most popular show in our 2016 survey (the Metropolitan Museum of Art’s fashion exhibition Manus x Machina) had around 6,000 visitors a day and the top show in 2015 (Saatchi’s Chanel exhibition) had more than 8,000 a day. This year’s biggest show had only 4,500.